The third Tourism Boot Camp commenced on Monday 12 March at PG Tops and Travel office’s with six eager candidates ready to take up the challenge of learning practical skills to better prepare them for their careers in the Tourism Industry. The candidates who hail from Khayelitsha, Namibia, Observatory, Kraaifontein and Bellville South unanimously agreed that the main reason they applied to Tourism Boot Camp is to help them get jobs in the Tourism Industry as most of them do not have any work experience in the Industry. 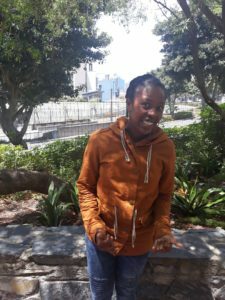 Baxolise Mahasha, who is originally from Gauteng has returned for her second attempt even more determined to succeed this time around. She says she is more confident and more geared up in terms of what is expected of her this time around. She aspires to pursue a career as a Reservations Consultant. 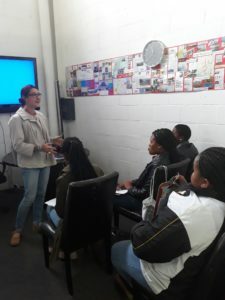 The first week’s course curriculum covered Cape Town Tours and Logistics training by Pieter Geldenhuys, Monade van Eeden and Lauren-Lee Isaacs from PG Tops and Travel. 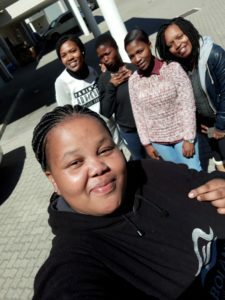 In depth training of the Cape Town highlights included : Cape Peninsula tour, Cape Town City Center tour, Langa Township, Robben Island Tour , Aquilla Safari and the Cape Winelands. Zile’ de Kock from Marine Dynamics orientated the candidates on the Shark cage diving and Whale watching tours offered in Gansbaai and Hermanus. Thank you once again for your time, Zile the girls found your session very informative and are very excited about the possibility of doing an educational in the not too distant future. The candidates were taught the the core principles of consulting which they readily applied to their timelines and consults as part of their Friday assessment. The good news is that all six candidates have made it through to week two where they will be trained on Front of House, Oral Presentation skills, Attentive Listening and Critical Thinking Skills. They will also be addressed by AirBNB, Capetowntourguide.com and their week 2 assessment will be done in conjunction with Bikes n Wines. Congratulations to the Tourism Boot Camp candidates who graduated last week, we are so proud of you: Anathi Maqolo, Zintle Mtsi, Zikhona Dunga and Kamva Deliwe. 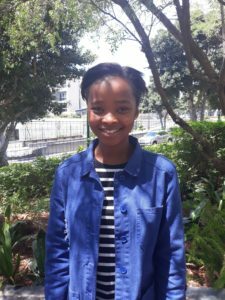 Anathi, has been placed at Giltedge for the two week period where she was shadowing in the Golf and Sports Department for her first week. 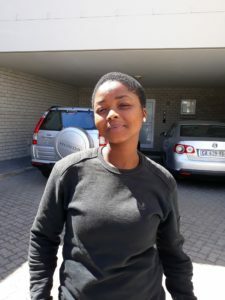 “I was nervous at first but I did okay,” says Anathi of her first day at Giltedge. 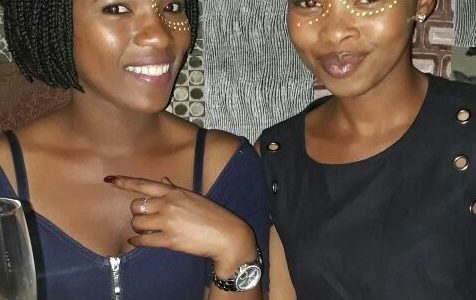 “They are letting me in on their admin work for consultants where I am checking availability for golf tee-off times, accommodation, restaurants and transfers.” Anathi also spent a week with the team of the Zambezi Queen, a related business. She has now been offered a contract as an admin assistant with PG TOPS Travel and Tours. 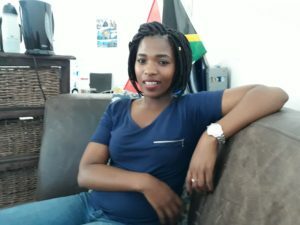 Zikhona is enjoying the busy environment of the Bikes&Wines office where she has stepped in to assist with reservations and administrative work . Industry partner Quintin Smith has generously assisted Boot Camp for fleshing out our customer service component, based on the onboarding process for Zikhona in their retail space. Although she is not yet riding a bike she says she will be a pro once she gets used to all the work, look out for her on the trails! 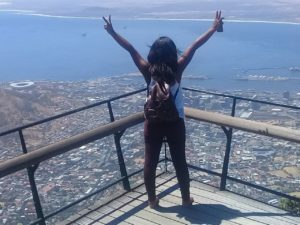 Kamva did her internship with Once in Cape Town. They were suitably impressed, and she has interviewed for the duty manager position. She is on the look out for a visitors services or front of house position in the industry where she can share her outgoing nature and welcoming smile with visitors. Watch this space…. © 2017 Tourism Boot Camp | PG Tops Group | All Rights Reserved.